My baby girl is miserable with croup this week. Fortunately, we’ve been able to manage it at home and haven’t had to make any late night visits to emergency. If your child has had croup, you know it’s just awful – fever, laboured breathing, a barking cough, trouble sleeping plus a runny nose, sore throat and everything else you get with a normal cold. Little Chop hasn’t wanted to do anything much except watch The Wiggles and Alice in Wonderland curled up on Mummy’s lap under a blanket, which suits me fine after three sleepless nights. Melbourne is cold and blustery at the moment so we’ve been staying home and keeping warm, which is what Little Chop needs at the moment, but it’s sent us a bit stir crazy. We usually head off for a walk late morning, pick up some milk, a decaf for mummy and bagels for lunch, then have a run around at the playground before heading home for a nap. Yesterday, Little Chop had her nap two hours early so I had a little time of my hands, and I was desperately craving a sausage roll from my favourite bakery. I haven’t craved much during this pregnancy except for these sausage rolls, so I decided to have a go at making something similar with what we had in the fridge. They turned out so delicious, I don’t think I’ll be needing to buy them anymore, plus I know exactly what’s in them, which means no processed meat. note: You don’t have to be exact with these measurements. I didn’t measure anything out, I just threw it all in. Preheat your oven to 220C. Prepare a baking tray by lining with baking paper or well-greased foil. Place the pastry sheets flat on the bench to defrost. In a large bowl, mix the mince, chutney, rosemary, breadcrumbs and salt with clean hands until well combined. When your pastry sheets are almost defrosted, you can begin to assemble the sausage rolls. Slice one sheet of pastry in half horizontally so you have two rectangles. Each rectangle will make a row of sausage rolls. 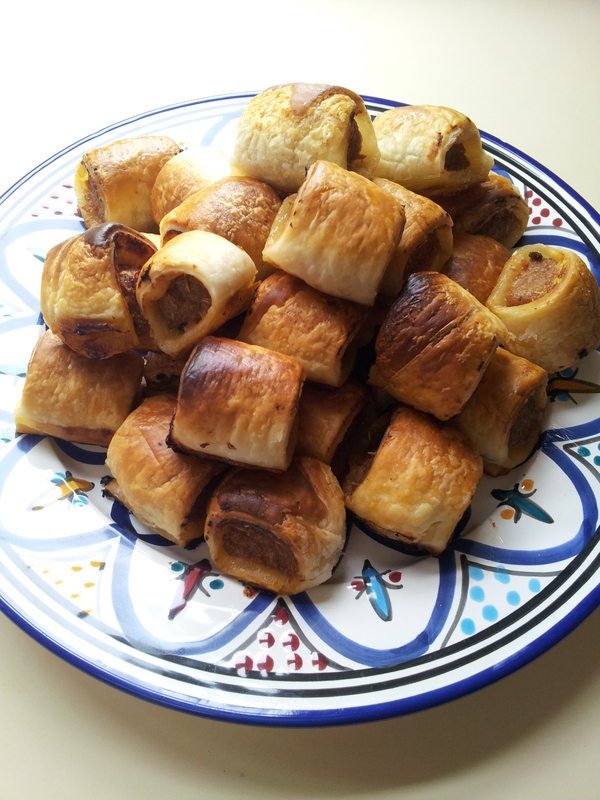 Take a small handfull of mince and roll it into a sausage shape. Place it lengthways along the middle of one of the rectangles and continue to shape it until it is evenly spread from end to end of the pastry. The mince strip should be about 2.5 cm (1″) round. From the top, fold the pastry over the mince then gently roll it towards you to close the sausage roll. Trim about half a cm off the ends of the roll, then slice the roll into 4 cm pieces. Place on the baking tray so that the bit where the pastry folds over is on the bottom. Repeat this process with each pastry rectangle. You may not get a full roll from the final rectangle so use what mince you have left and trim off the extra pastry. Gently brush tops with milk. Place in oven and bake for about 40 minutes or until brown. *As the meat cooks, the juice will come out and pool in the bottom of the tray. Don’t worry. This will evaporate and create a nice caramelisation on the bottom of the sausage rolls. 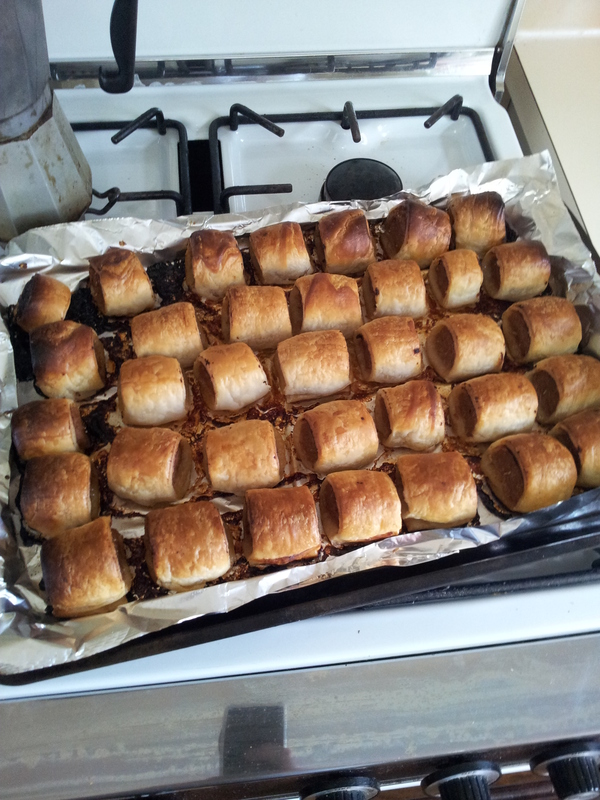 Makes about 34 mini sausage rolls. Hint: If you want to make these ahead of time, you can par bake them until light golden then leave to cool. Freeze in bags until needed. Remove from freezer to defrost for 30 minutes while preheating oven. Bake until brown.